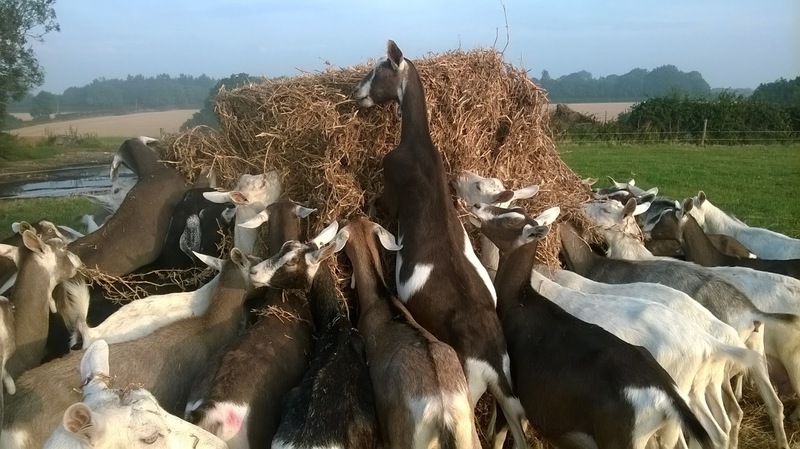 Ellie's Dairy - The Finest Goat Milk, from Kent: Back in the land of blogging!!! Back in the land of blogging!!! Well, it's been a while but here we are again! It's been a good few weeks of long solo evening milking sessions for me while David has been frantically hedgecutting, trying to keep ahead of the farmers harvesting and re-sowing their crops. To be honest .. by the time I've been getting home at night, I haven't had the wits to string two decent words together for you ..
Added to the fact that my trusty old laptop crashed .. terminally ... some weeks ago. I have commandeered David's laptop but have had to rebuild it with all the software that I need. And then discovered that it didn't have an internal Bluetooth adapter .. so I couldn't transfer my photos onto it. And, let's face it .. what's the point of blogging without piccies?! Anyhow ... having dredged my old IT memory banks and remembered how to do all this stuff, I think I am almost there and now have an (almost) working laptop again. Hurrah! The last few weeks have been utterly glorious .. if a little too hot in places. 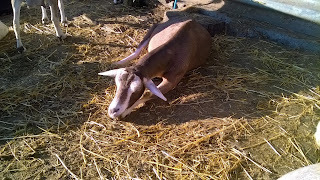 There has been a lot of lying around panting, although some girls do enjoy catching some rays after morning milking .. Here's Campie soaking up the sunshine! But generally, those goatie girls don't like it too warm and have been pretty grumpy recently. Much happier when the weather cooled down ..but then it rained and they were grumpy again. No pleasing some people. Babies are growing bigger and noisier every day. 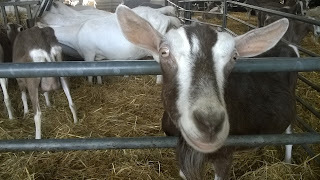 Only a few left on bottles of milk now as most of them are all weaned and grown up. Cheesemaking and milk bottling has all continued apace ... It has been lovely to have all our staff back fighting fit and working hard! We have been busy at Borough Market and all our farmers markets throughout the summer ... and it's really nice to see all our customers returning refreshed from their holidays! Sadly, we have lost 3 of our older ladies over the past few weeks. As time goes on, we have an increasing number of 'oldies' and so it is inevitable that we will have to say goodbye to more of them .. But it never gets any easier, especially when they are girlies we have known and loved for many years. 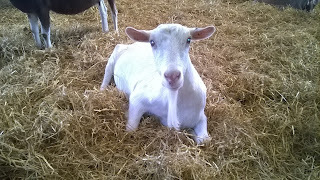 So .. RIP to our beautiful Foxglove (one of our first goaties) who left us recently, aged 11 years .. Here she is as a younger mum a few years ago. Beautiful girl. We think she had some kind of stroke as we found her collapsed and unable to stand one evening. Emergency call to the vet confirmed that there was nothing to be done and so she drifted off to the big goatshed in the sky. 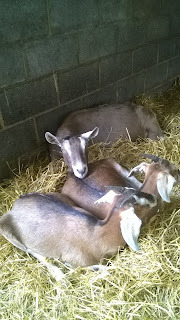 And last week we said a planned goodbye to Margot and Kim who were both getting very unsteady on their feet. Both around 11 years old, they have suffered with arthritis since last year and were starting to struggle a little bit. With the cold and damp weather just around the corner, we took the tough decision to send them to sleep before they suffered too much pain. 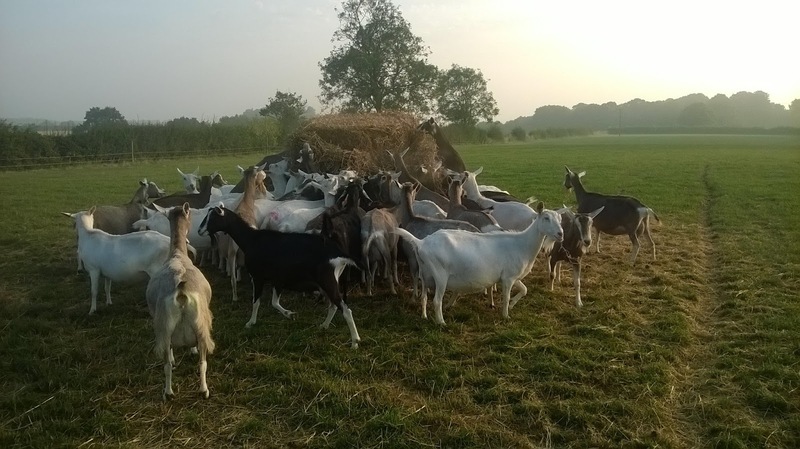 Our lovely vet Peter sent them away together side by side on a beautiful hot sunny day, surrounded by all their friends. Kim was a particularly sweet girl - she came to us as the eldest of the 'Mary' goats only a few years ago. 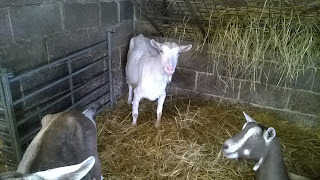 She was barely in milk when she arrived and has never kidded with us .. she was just a beautiful, loveable old lady who has enjoyed her last few years in retirement. As David finished our own harvest some weeks ago, he also managed to acquire a few bales of pea straw. 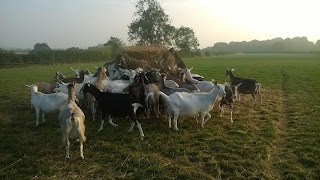 The girls have never experienced this before so, as it can be a bit messy, David decided to erect one of the old round hay racks in the field and put a bale in there for the goats to try ... Took a few minutes before they all piled out there .. but it seemed to be very popular with everyone! 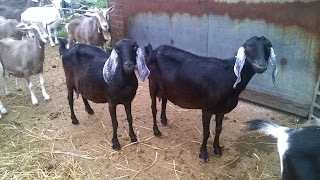 Shares has been looking after her young chaps very well and they have grown hugely since you last saw them ..
Dear old Betty is still going strong .. grumpy as ever ..
And we still enjoy seeing double as Cleo hangs out with mum JoJo ..
Don't forget that you can always catch little updates and piccies on Twitter (when we can get a mobile signal!). Check out our feed @elliesdairy. So, it's lovely to be back. 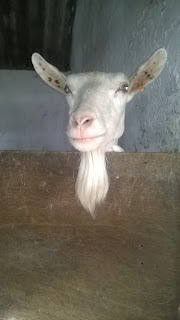 I will do my best to keep you up to date with all the goatie news from now on!